NEW YORK -- Everyone got robbed. The players, the crowd, the fans watching at home. 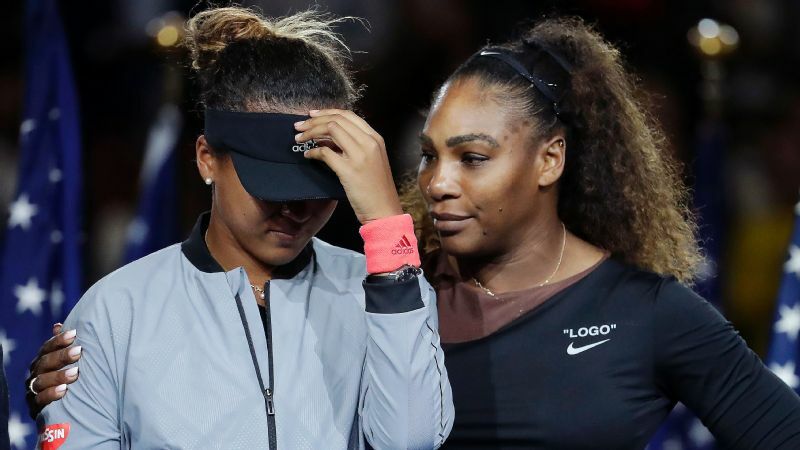 The Serena Williams-Naomi Osaka US Open final was supposed to be a heavyweight boxing match between two of the hardest-striking players in the game. For both women, history was at stake. On the line for Williams was a 24th Grand Slam title and her first since becoming a mom. Twenty-year-old Osaka, the first Japanese woman to make the final of a major, was attempting to win her first Slam -- against the woman who inspired her to play the game. One by one, the women were announced onto the court beneath swirling lights and smoke machines and amid deafening cheers, the crowd joyful at the sight of Williams in another Grand Slam final and respectful toward the budding young star. And for one set of tennis, the show lived up to its billing. Then, early in the second set, it all unraveled. 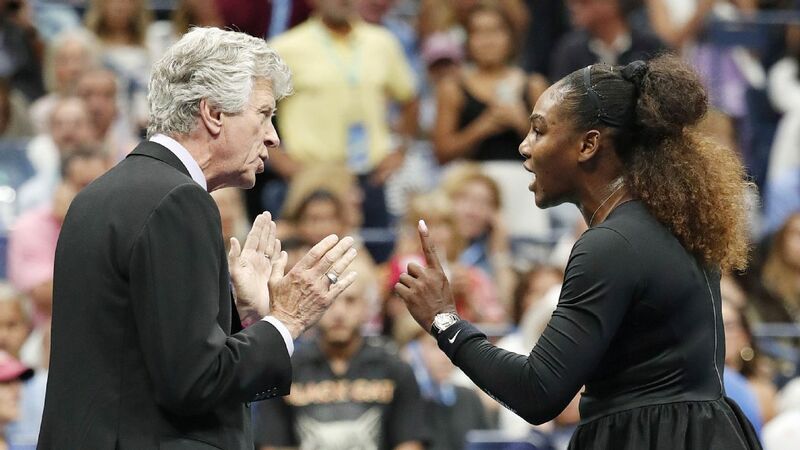 In the second game, with Osaka up a set and serving at 0-1, 40-15, chair umpire Carlos Ramos handed Williams a warning for a coaching violation when he witnessed her coach, Patrick Mouratoglou, gesture to her from her player's box. In the moment, Williams denied receiving coaching -- she did the same later at her news conference -- and argued with Ramos. Two points later, she lost the game. For a moment, the interaction seemed to spark Williams to life. She held serve and then broke Osaka to take a 3-1 lead. The crowd reacted with the loudest cheers of the night, and a standing ovation for their queen. Then, during the changeover at 3-2, the fireworks began. After Osaka broke her in the fifth game, Williams smashed her racket and was penalized a point for a second code violation. 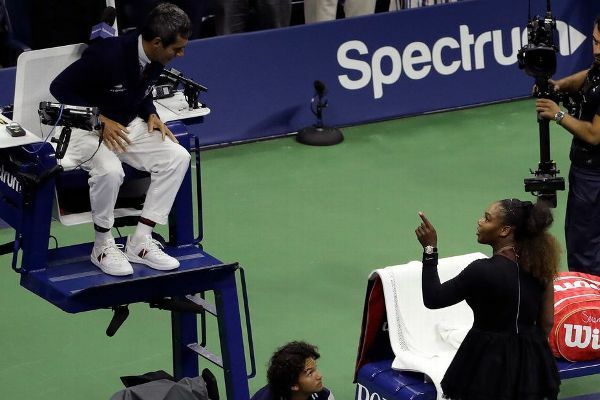 Before the start of the next game, Williams walked to the chair to plead with Ramos again to tell the crowd she was not cheating. "I didn't get coaching. You need to make an announcement that I didn't get coaching," Williams said. "I didn't cheat. How can you say that? I have never cheated in my life. I have a daughter and I stand for what's right for her. You owe me an apology." There should have been only tears of happiness for Naomi Osaka after winning the US Open. At that moment, the boos -- which had started after the initial warning -- became so deafening they delayed play. On every serve. After a few points, Ramos stopped his attempts to settle the crowd. Through it all, Osaka impressively held her focus and won the next two games. At 4-3, she was two games from the title. But Williams couldn't let that earlier warning go. Again, she walked to the chair and exchanged words with Ramos. "You stole a point from me," she said. "You're a thief." Before fans knew what was happening, Ramos called both players to the chair and docked Williams a game penalty for verbal abuse: 5-3 Osaka. Had Williams let it go -- or had Ramos let the match play out -- maybe Williams could have forced a third set. The way Osaka was playing, it's unlikely, but Williams is a 23-time Grand Slam champ for a reason. She knows how to find that next gear. "It's hard to say, because I always fight 'til the end and I always try to come back, no matter what," Williams said after the match. "But she was also playing really, really well. She played an amazing match. She deserved credit, she deserved to win. At the end of the day, that's what it was." As Osaka took a ball to serve for the match at 5-4, the outcome seemed inevitable. Williams was visibly unnerved by all that had transpired, while Osaka remained steady. She had played brilliantly all night, dominating Williams from the jump. 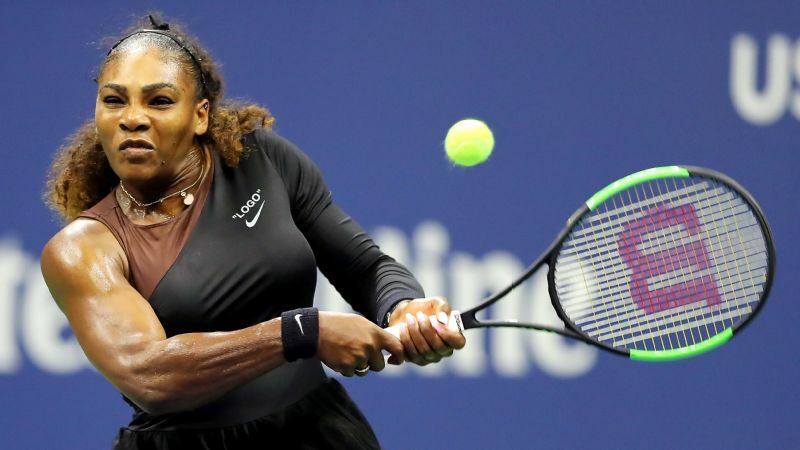 She'd out-served her, winning 73 percent of her points on first serve, out-aced her (six to three) and committed only 14 unforced errors all match. Five points later, Osaka was the 2018 US Open champion. But nothing about her body language suggested as much. After hitting the final point of the match -- a service winner -- and becoming the first Japanese player to win a Grand Slam, Osaka should have been overcome with the desire to celebrate. Instead, she walked somberly toward the net, bowed toward Williams and stood as her opponent embraced her in a comforting hug. Everyone got robbed. But no one more than Osaka. "I felt bad because I'm crying and she's crying," Williams said. "You know, she just won. I'm not sure if they were happy tears or sad tears. I felt like, 'Wow, this isn't how I felt when I won my first Grand Slam. I definitely don't want her to feel like that.'" It was a difficult moment to watch. The champion should not have been the one being consoled. Regardless of how you feel about how things unfolded, what's not up for debate is the fact that Osaka was robbed of her moment. She deserved better. Because what was lost in the tumult of Saturday night was the incredible match Osaka played, the steely nerves she displayed by fending off five of six break point opportunities and the power with which she smashed the cover off the ball over and again. As Osaka walked to the stage for the trophy celebration, the boos continued. She pulled her black Adidas visor down over her eyes and cast her eyes downward. Tears streamed down her cheeks and she looked as if she wanted to disappear. Williams knew only she could stop the jeers. And she did. "I just want to tell you guys, she played well and this is her first Grand Slam," Williams said to the crowd, tears filling her eyes. For nearly 20 seconds, both women stood silent as -- finally -- the crowd erupted in cheers. Whether they were cheering for Osaka or for the sportsmanship displayed by Williams didn't matter. At least they were cheering. "Let's make this the best moment we can," Williams said. That kindness, as much as her incredible play, is what Osaka said she will remember about Saturday night. "I know she really wanted to have the 24th Grand Slam," Osaka said in her postmatch news conference. "Everyone knows this. It's on the commercials. It's everywhere. But when I step onto the court, I feel like a different person. I'm not a Serena fan. I'm just a tennis player playing another tennis player. But then when I hugged her at the net ..."
Osaka trailed off and began to cry. You wished Serena was there to console her once again. "When I hugged her at the net, I felt like a little kid," she said. "It doesn't really feel that real right now. I think maybe in a few days I'll realize what I've done." Hopefully by then, she won't be the only one.